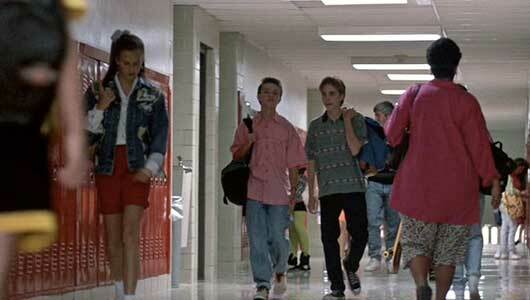 Jonathan Brandis wears black high top Converse “Chuck Taylor” All Stars in the film. Chester doesn’t think much of Matthew, his fiancee’s teenaged son, until he begins coaching a girls soccer team. After many years as a stand up comedian famous for his one liners like “take my wife...please”, Rodney Dangerfield had made the big time nationally after years of appearances on talk shows and the success of the 1980s films Caddyshack and Back to School. Ladybugs, produced in 1992, was an attempt to follow up the basic theme of Dangerfield’s comedy routines, a nice middle-aged guy, who gets no respect from the authorities or powers that be, and continually spouts one-liners as an aside to the audience. Ladybugs follows the formula, this time with a family sports theme. Dangerfield is cast as Chester Lee, a businessman desperate for a promotion at work, but overlooked by his boss, industrial magnate Dave Mullen (Tom Parks). Chester needs a raise so that he can afford to marry his ladyfriend, Bess (Ilene Graff). When Lee finally gets a meeting with Mullen, he sees a case filled with soccer trophies in his office. The company sponsors a girls soccer team that has been highly successful in the past, but is currently in disarray. When Chester tries to butter up Mullen by telling him that he was a good soccer player when he was younger, Mullen quickly enlists Chester as the new coach of the team, called the Ladybugs. Coercing his assistant Julie (Jackée Harry) to become his assistant coach, Chester thinks things will be easy, but only one player from the previous team has returned. Mullen’s daughter Kimberly (Vinessa Shaw) is on the team, so Dave Mullen takes a personal interest in how the Ladybugs are doing. Matthew has a crush on Kimberley, who is a member of the Ladybugs soccer team. As you would expect, the season starts out terribly for the Ladybugs, as they are decisively beaten by their opponents in their first few games while their clueless coaches can only watch. With his boss displeased and desperate for a way to win, Chester turns to his fiancee’s son Matthew (Jonathan Brandis) for help. Matthew was a star soccer player at school, but had to quit the team due to bad grades. To make things more interesting, Matthew has a crush on Kimberly, although she hardly notices him. At first Matthew refuses to help Chester, but then he discovers that Kimberly is on the team. Now things are different. To gain access to Kimberly, Matthew agrees to put on a wig, dress in drag, and become a member of the Ladybugs team using the name Martha. Matthew/Martha provides the needed spark to the Ladybugs and they soon become successful again, consistently winning their matches and working their way up to the championship game. All of this is accompanied with semi-risque wisecracks from Dangerfield and some expected cross dressing humor. One such scene is set in a department store when Chester goes to buy more clothing for Matthew. Another is when Matthew has to make numerous clothing changes to hide his crossdressing from his mother when Kimberly drops by his house unexpectedly one afternnon. Chester tracks down Matthew to try and persuade him to help out the Ladybugs..
As expected things come to a head at the championship game for the Ladybugs and their opponents, coached by your typical xenophobic coach. The Ladybugs have greatly improved as a team but are unable to absorb two great losses — Matthew, who was dropped from the team when his mother Bess finds out about his cross dressing, and Kimberly, who has not been playing well, is dropped at the request of her dad and Chester’s boss, Dave Mullen. 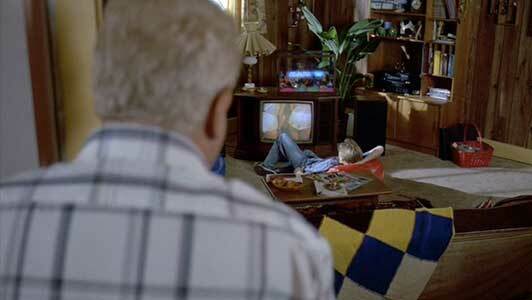 Bess also breaks up with Chester, leaving Chester to flounder alone at the championship game. As the Ladybugs are being outscored 3-0 in the first half, Matthew takes charge. Deciding that honesty is the best policy, Matthew takes a taxi over to Kimberly’s house and confesses who he is and why he did it. The two return back to the game and Matthew tells the rest of the team what he just told Kimberly. Matthew’s honesty fires up the Ladybugs. In the second half, they end up tying the game and after regulation, Kimberly scores the winning goal on a penalty kick. All is good again: Chester gets his raise, reconciles with Bess and marries her, while Matthew and Kimberly start dating. Matthew joins the Ladybugs in drag, as Martha..
Ladybugs could be very offensive to some people, if you think of the ramifications of Dangerfield’s one liners, and how the cross dressing theme is handled. 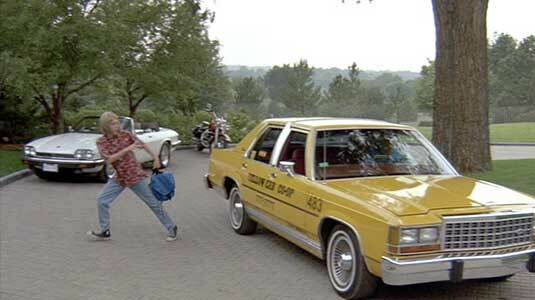 You have to wonder why this particular story was chosen as a vehicle for Rodney Dangerfield in the first place. Most youth soccer teams don’t have coaches in their sixties, spouting politically incorrect one-liners, and very few teenaged boys would want to cross dress to play on a girl’s soccer team, even with the girl of their dreams as a fellow teammate. Maybe that is supposed to be part of the humor here, but a lot of the story falls rather flat. Yet, for some reason it doesn’t seem offensive, just silly at times. 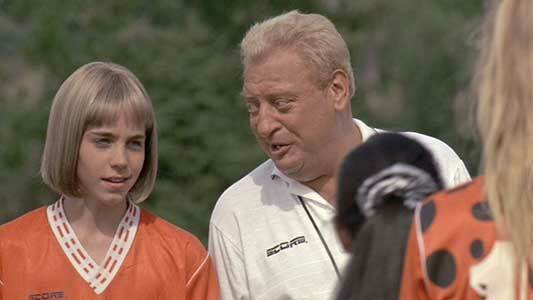 Rodney Dangerfield is Rodney Dangerfield. No matter what comes along or what complicates things, Rodney just continues with his routine. Jonathan Brandis did the best could with the material, and luckily for him he didn’t have to put on make up or falsies. That would have only made Martha more unbelievable than she already was and Matthew seem like less of a typical teenaged male jock. 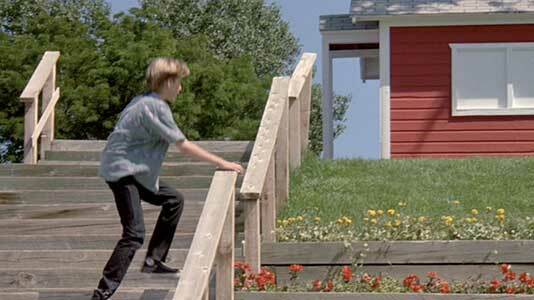 Jonathan Brandis’ role could have been funnier with better writing for his character. Martha was only supposed to be seen on the soccer field, so why have a long scene with Martha and Chester at a department store buying a dress (with the usual mixup, shock humor from other store customers)? It would have been much more interesting to have an extended off the field scene with Martha and Kimberly, or a scene with Mathew’s best friend, Paul, somehow meeting up with Martha. A film like Ladybugs really shows off the flaws of the Hollywood system for B films: Take an idea that was successful (like Caddyshack) and continue to remake it over and over again with different dressing (or should we say cross dressing?). For that you have to blame the producers, director, and writer. This time the floundering fish idea was a little too far out of the water. “Martha” hurries to tell Kimberly the truth about who he really is. Matthew makes a leaping dive to catch the football and impress Kimberly. 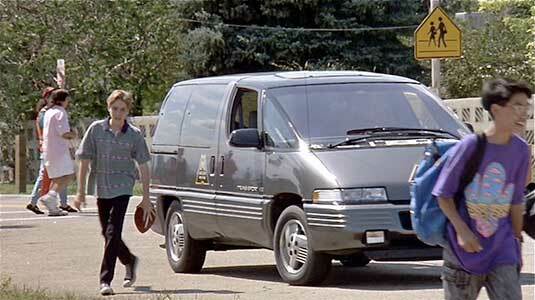 When Matthew (Jonathan Brandis) was not posing as Martha, he was seen wearing black high top chucks, sneakers he wore in a number of his projects. 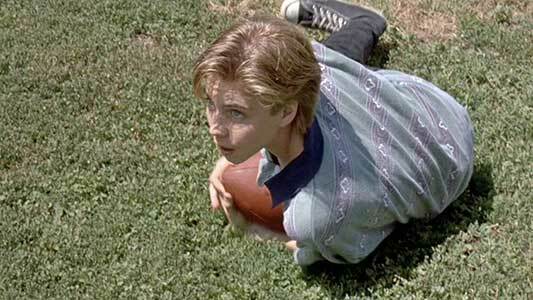 The best chucks scene is when he is trying to impress Kimberly and has his buddy Paul pass him a football. Unfortunately, the pass is a little overthrown, and Matthew has to make a diving catch that lands him on the ground. Matthew goes to retrieve a soccer ball at the practice. Ladybugs. (1992) Rodney Dangerfield, Jackee Harry, Jonathan Brandis, Ilene Graff, Vinessa Shaw, Tom Parks. Directed by Sidney J. Furie. Categories: Comedy, Sports.